DotA 6.70c AI R2 Fun v2.5 Map | More than 25 Fun Heroes! 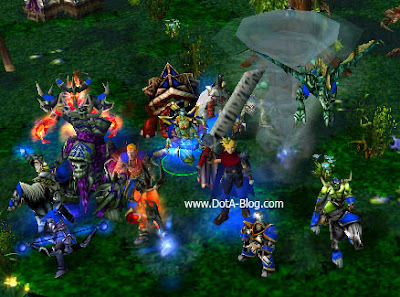 This map already came out for quite some time, but the release of DotA 6.72 overshadow it. SuperWaitSum is the creator of this map and he continue the work of the previous AI Fun map maker. You can check out the download link and tavern list below! n u just known this day ?? this map full of bugs ! 5th . when cast icarus sun ray " the game crashed "
I Hate this map !! please add more hero on fun map please . . .
and i hope 6.72ai+ will come up soon. . .
we as dota player must report the bug to the creator right ? for the best to future version..
AI will start dropping item at fountain and bring along scripts when being swindle 2-3 times.. then u got free item to trade in ^^..
another bug is when i use distruptor 2nd skill, then if AI use certain spell like hex, warcraft III window dissapear without even showing a "FATAL ERROR" box..
felguard 1st skill is very usefull to throw away heroes to trapped places like hole between top lane sentinel 1st tower and secret shop^^..
when AI start stick together and pushing middle lane, just use that skill to roshan and place roshan at the middle of the lane..
because after lvl 6, puff cant be stopped ! yeah right, felguard and puff are powerful enough to end d game in just 20 mins ( for me)..
hey, we can find the old but powerful razor here..
all in all, the map is awesome..
there are still bugs, but we should expect those, because there's no such thing as perfect map..
it maybe the computer's fault or themap itself, maybbe you encountered problems while downloading, causing the map to have anomalies..
but expect those bugs.. we can't avoid those, but we can help the map maker to improve the map..
is there any way to play this map on other version?? Hey, can u add all the old heros like,anub'arak? please. anyone known how to cure this problem? What i need is New Item Fun !!! OMG CAN ANYONE HELP ME? I cant find the map in my warcraft after putting it in. Im currently using 1.24e. Anyone with the same problem but managed to solve it? view all your folders inside the game.. search for the map. go to local area network click create then find the map... the map must be inside the map folders of the warcraft 3 game. there is a bug in formless. it copies dragon knights dragon blood and the effects does not show. the ulti of sven is also ineffective when copied. the there is error when some moves are copied without being able to reset them. and why cant shadow fiends -as aura cant be copied??? y cant buy special item? ?